Visually identify lockout/tagout devices currently in use with ACCUFORM SIGNS Lockout Store-Boards. The 6-Padlock Lockout Store-Board is designed so that your padlocks, tags, and lockout devices are conveniently available and easily accessible. Lockout/Tagout devices are shadowed on the board so workers can quickly identify that an item is in use or needs to be returned to the designated storage location. 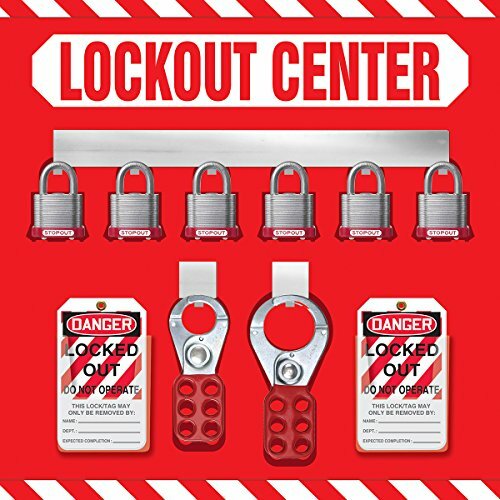 Hang the Lockout Store-Board near equipment and machinery, or in a central location in your plant. Durable aluminum board has aluminum pronged hooks to hang padlocks and lockout hasps. Thick, molded, clear poly pockets are sized to hold lockout tags. Designed for tough environments.